A feather is an outgrowth of the epidermis of birds. Feathers are composed of the protein keratin. They provide thermal insulation and waterproofing, give the body its streamlined shape, and those of the wings and tail play a crucial role in flight. 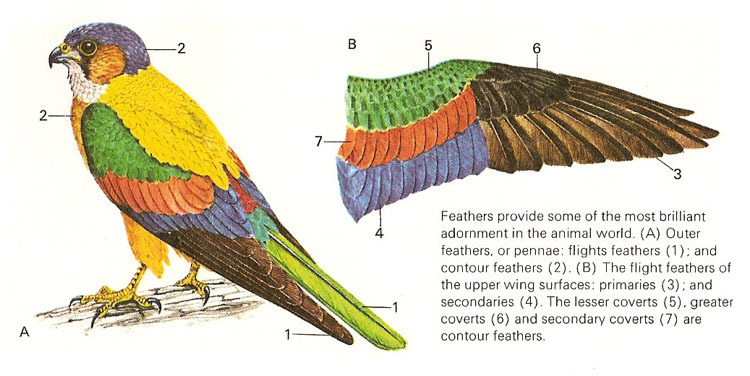 There are four types of feather, simple down feathers and pin-feathers (filoplumes), more complex contour feathers, and specialized powder-down feathers. Contour feathers are large and sheathe the body of the bird, as well as covering the tail and wings. The actual quill of the feather is the section of the stem which remains embedded in the skin. It is usually hollow with two small openings, one at its base and one where the quill perforates the skin surface. The rest of the contour feather above the skin's surface is called the vane; it consists of a central, solid shaft, or known as the rachis, extending from the quill and a very large number of small branches (barbs) coming off from either side. The barbs are so closely packed together that they appear to form a continuous surface. In fact they are separate units, though each one is attached to its neighbors by a series of barbules which have minute hooks called barbicels for cross-attachment. Down feathers are much smaller and simpler. The quill is very small and at the surface, instead of continuing as a main stem, it divides to form a spray of slender branches. The fluffy coats of young chicks are made up entirely of down feathers. Pin-feathers are even simpler. They consist of just the quill and a short stem which divides at the top into a bunch of small barbs. Powder-down feathers are possessed by only some birds, e.g., bitterns, herons, and some hawks. They break down into a powder useful for removing slime and dirt from the rest of the plumage. Contour feathers, fitted to the wings and tails of birds, provide a large surface area to push against the air during flight. The sheath of smaller contour feathers formed over the whole body gives the bird a streamlined shape essential for movement through the air. The smooth, flat surfaces of the contour feathers are formed by the tightly linked barbs. If the barbs become disarranged by unhooking of the barbules, the birds' preening action soon repairs them. For birds which do not fly, it is not important to have smooth, streamlined feathers. Ostriches, for instance, have plume-like contour feathers, known for their use as decorations. Down feathers are concerned with insulation of the body from the cold. They help trap a layer of air against the skin. In adult birds they are not usually conspicuous as they are covered by the contour feathers. Feathers can be moved by the action of muscles just as the hairs that cover mammals can be moved. Ruffling of feathers, for instance, can take place during cold weather (the additional trapped air gives extra warmth) and the position of contour feathers on the wings and on the tail can be controlled in flight. Again like hairs, feathers are supplied with nerve fibers and can be used as organs of touch. Birds that fly at night have very sensitive hairlike feathers on their faces rather like the whiskers of cats. Swimming birds protect their feathers from the water by a coating of oil. The oil comes from a special oil gland at the base of the tail and is spread over the feathers by preening with the beak. A few birds use their feathers for making noises during flight. The snipes "bleat" as it circles over its marshland home is caused by the air vibrating special tail feathers. The sound is probably used as a warning noise. The woodcock which flies at night "whistles" as air passes through peculiarly constructed contour feathers on the wing. It is probable that this sound acts as a position marker for others. Some feathers are colored by pigments contained inside them. Melanins are particularly important, giving blacks and all shades of brown. Carotenoids give reds, yellows, and oranges. When no pigment is present all the light is reflected and the feathers appear white. Other feathers have a glossy, dark-colored sheen (iridescence) caused by a special surface layer of keratin. Color may be important in blending the bird with its background. Mottling is especially useful as it breaks up the distinctive outline of the bird when it is at rest. Light-colored plumage reflects the sun's rays and in deserts is probably a protection against excessive heat. Distinct coloring probably helps birds to recognize other members of their own species. Birds that live in flocks, such as starlings and rooks, are always very conspicuously colored. Brightly colored plumage of birds such as male peacocks and pheasants are used for courtship displays.